The alpha female with the Soda Butte Pack, #14F, was recently found dead during a tracking flight. Early investigation appears she was killed by moose, which was located near her body. Both the moose and #14 had feeding ravens. The moose also appeared to have died about the same time as #14. The remainder of the Soda Butte pack were resting nearby. It was hoped that she would have pups this year. No 14’s last litter of pups was in 1997. 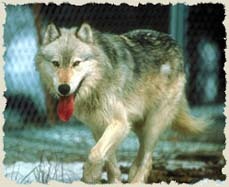 With the death of #14F, the remaining living wolves from the 1995 reintroduction are 2M and 7F (alpha pair of Leopold Pack); 8M, alpha male of the Rose Creek Pack; 9F, who may have denned in what is unofficially named the “Valentine Pack;” and 5F of Crystal Creek . There is a possibility that the pack may be renamed now that the last original member has died, and because the pack has not been located anywhere near Soda Butte Creek, its original release site since early 1995.